Not long after the two television sets appeared on my street, an assortment of sofas, tables and chairs were also dumped. Unfortunately, it rained on and off that week so the unwanted furniture was quickly rendered unusable. 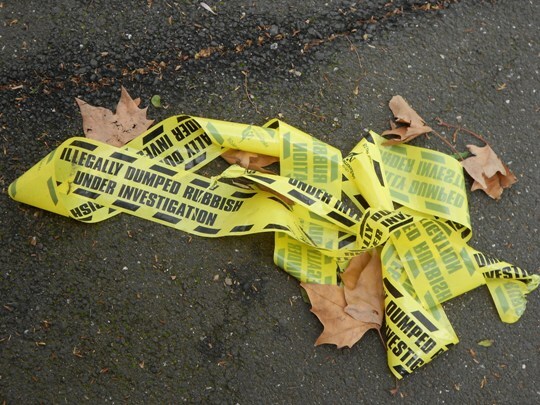 Yellow tape appeared round all the offending items, stating “Illegally Dumped Rubbish – Under Investigation”, which just made the unsightly pile of junk even more of an eyesore. I’m very grateful for my free TV and my free heater, but I do think that if you set something out on the kerb, you have a responsibility to bring it in again if no one takes it. There’s no excuse for just leaving rubbish on the street because the City of Melbourne will collect hard waste for free once a year, you just have to phone to arrange a collection time. Perhaps they should put more energy into advertising this, instead of plastering yellow tape all over the place. The unwanted furniture on my street has since vanished and all that remains is a torn off strip of tape fluttering on the ground. It was so ironic, I just had to take a photo. I sometimes look at that unwanted furniture one occasionally sees in walking about and ponder grabbing it, but really… it’s too big to carry without a car, usually… and where would I put it? What a fantastic post about illegally dumped rubbish and your experience of frustration Helen. 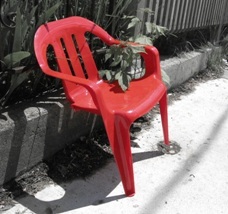 One of our blogs explores why illegally dumped rubbish is bad for the community. This might give you some more ideas on top of your fantastic observations. Thanks for your comment dbad1. I like your blog! You and your outdated opinions need to be put out on the kerb….